This is the basic guide and rule for creating Shellmo. Shellmo is a platform for creating robot. Enjoying and learning making robot. Especially for hobby and education. This is the most important for Shellmo as Shellmo. 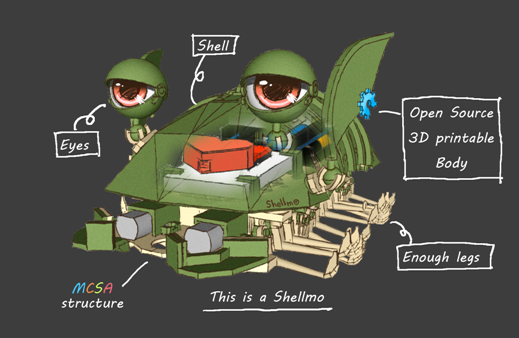 The structure of Shellmo is "MCSA". Motor, Core, Shell and Accessories. For controlling other modules and for connecting with Motor and Core. Cover of circuits and it's work as "face" of Shellmo. This is not a module. It's an additional parts of each modules. Like Eyes, Ears and Heart. Accessory for making their own Shellmo with ease. Example, making original eyes is not difficult compare to make new module.